Historic Shipwreck find "The Mermaid"
Researchers are closer to solving an Australian maritime mystery. 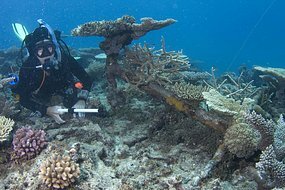 A team made up of 40 archaeologists, scientists and volunteers has confirmed a shipwreck found on the Great Barrier Reef is that of the Mermaid. The Government ship sank in 1829, south of Cairns, while attempting to deliver a dispatch to disband the fledgling Port Raffles community in what is now the Northern Territory. The Mermaid was earlier used to chart northern Australian waters. The Curator of the Australian National Maritime Museum, Kieran Hosty, was at the site of the wreck. "This morning one of our divers made quite an exciting find," he said. "They located a pulley sheave, it's part of the rigging of the ship and on the pulley sheave there is quite discernible broad arrow mark, now a broad arrow is a government mark and they put it on all government property," he said. "I'm very, very confident that we have the Mermaid site." Mr Hosty says the Mermaid played an important role in mapping the Australian coastline. "The Schooner Mermaid, it was cutter originally, it was a one masted vessel, but the cutter of the Schooner Mermaid circumnavigated Australia charting the Australian coastline," he said. "It was filling in the gaps left behind by Matthew Flinders. "And so it was a very important link in establishing maritime routes around Australia. "Ironically it was... actually one of the vessels used by Phillip Parker King to chart the coast and quite ironically it was the vessel that ran aground on the Great Barrier Reef in 1829." The sinking of the Mermaid is also a case of Maritime folklore. "The Mermaid captain, he wasn't Phillip Parker King at the time, it was another man by the name of Nolbrow," Mr Hosty said. "Captain Nolbrow made the decision to sail too close to the reef, he was acting against the wishes of his junior officers and acting against the direction of the colonial government. "The only accounts of the wrecking we have are from the junior officers and they accused Nolbrow of being drunk, they accused him of being irrational." The team has also located some of the efforts by the Mermaid's crew to salvage the ship. "They (the crew) tried to get the vessel off the reef, they deployed a kedge anchor and they tried to drag the vessel off over the site," Mr Hosty said. "That was another indicator that we do have the Mermaid because we've actually found that kedge anchor. And eventually the abandoned the ship. "They were in the ship's boats for 11 days until they were picked up by another vessel." Mr Hosty says the ships location in the reef explains why it has taken so long to find it. "The thing that we have here is that you can't use the device that actually provides a picture of the seabed because of all the coral in the area, so we've been flying in divers and snorkelers every day to actually swim the area," he said. "We've also been using metal detectors and magnetometers to try and pick up metal signatures. But all this takes a bit of time." Adapted from a report by Annie Guest for PM on January 7. 1,032,261 Unique Visits Powered by PHP-Fusion copyright © 2003-2006 by Nick Jones.